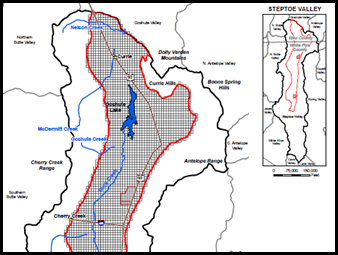 In support of the construction of Ely Energy Center, a proposed electric power plant, a hydrogeologic framework and groundwater model of the valley-fill alluvium within Steptoe Valley was needed. The objective of the study was to evaluate potential environmental impacts associated with groundwater extraction at the plant. 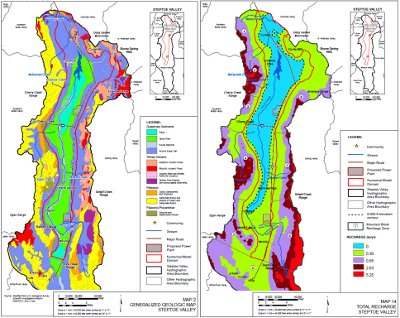 The groundwater model was developed by assimilating and managing information for an entire basin from well completion reports, a review of historic and proposed water rights information, aquifer test analyses, long term groundwater elevation measurements and geophysical reports. A detailed groundwater budget was developed for the model to reflect recent and historic water rights. Updates to and modifications of the water rights allocations were incorporated into the model during predictive calibration efforts to reflect the adjustments to water availability for the proposed scenarios. Groundwater modeling analyses were performed to determine impacts to existing water rights, groundwater levels and streams. This project was completed on schedule and within budget in January, 2009.